One of the most beloved aspects of social media today is the manner in which it allows fans to connect with their favourite celebrities and public figures, interacting with their idols in a way which was simply not possible for earlier generations. Countless apps and platforms now exist which enable you to do just this, whether that be the micro-blogging melting-pot that is Twitter, the global behemoth by the name of Facebook, or the image-conscious world of Instagram. This begs the question; why would you feel the need to force your fans off of the networks they know and love and opt to only offer such content on your own exclusive platform? Perhaps we should pose this question to Taylor Swift, as she has just partnered with mobile-entertainment company Glu – best known for celebrity-themed mobile apps such as Kim Kardashian: Hollywood and Nicki Minaj: The Empire – to launch a brand new social app by the name of The Swift Life. Glu CEO Nick Earl referred to the app as “a new digital entertainment project,” and “a deeply social environment,” however to me The Swift Life basically seems like a rather generic social app, with design elements borrowed heavily from existing platforms such as Instagram, Tumblr and Facebook, designed solely with the intent of fuelling Ms Swift’s ego and likely grabbing some extra cash from her fans in the process. That being said, the app does come with a few features that may be of interest to the artist’s die-hard fans. Alongside the standard sharing and liking functionality we expect of all apps of this nature, users will also be able to view “exclusive” photos and other Taylor-themed content, all while engaging directly with the star herself via likes and comments. 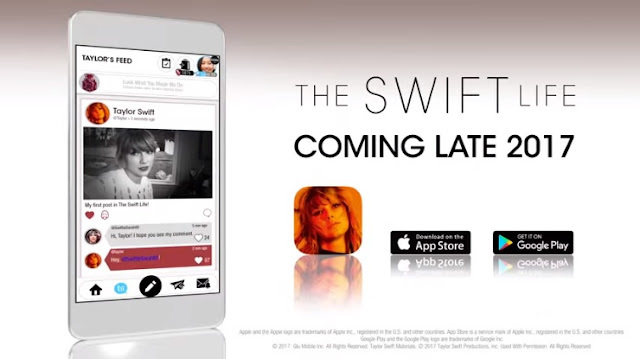 The app also incorporates a set of emoji stickers bearing the cringe-inducing name of “Taymojis”, as well as a fully-integrated music player loaded up with all of Taylor’s best known tracks and latest releases, with new songs reportedly being added each week. Returning full circle to my initial complaint regarding the app however; why could this same content not have been offered through existing and established platforms, on which Taylor has already amassed an impressive following? The answer likely boils down to finances. Taylor has proven herself to be a shrewd businesswoman, and likely recognises the potential gains to be made by launching an app such as this. For one, she has more than enough of a following to ensure a consistent active user base which will help to draw in substantial figures via advertising revenue. Also, given Glu’s track record of releasing free-to-download apps loaded up with in-app purchasing options, some form of paywall will likely be included in the app, restricting the most sought-after content to those willing to part will their hard-earned cash. I sincerely hope I am proven wrong in my assessment and The Swift Life turns out to be more than a shameless cash-grab at the expense of the star’s fans, but we will have to wait for the app’s beta launch, scheduled for late 2017, before we know for sure.